It’s tough to take risks in filmmaking. Directors want to deliver something stylish and interesting, but they don’t want to doom their project to an endless conversation about “gimmicks” that overwhelm the legitimate appreciation of everything else it has going for it. There’s a tendency to oversell and underdevelop, to rely on the audience’s fascination with the Thing rather than to make the Thing meaningful. It’s a tough needle to thread, and it rarely works out. The key is to use the Thing as an extension of a theme or narrative element that already exists. 2014’s Locke takes a few of these risks by restricting its audience’s point of view to a single location via a single character. 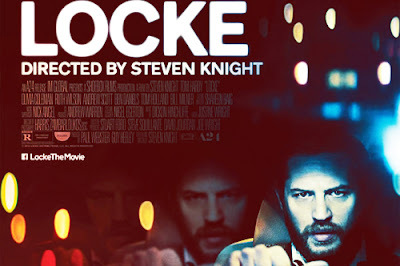 It feels a little obnoxious at first, but we quickly realize why a distinctive visual style is essential to the overall piece: Locke is about the way a character’s isolation influences his ability to communicate. It’s about the space between different phases of his life and the way he uses that space to control how he gets to each one. Ivan Locke (Tom Hardy) is on a long, late-night drive down the motorway toward London. There are a number of things on his mind: the cold he’s trying to manage, the football match he’s supposed to be watching with his family, and the monumental construction project he’s due to supervise early tomorrow morning. Tonight, though, he’s driving to London. He’s driving away from all that. 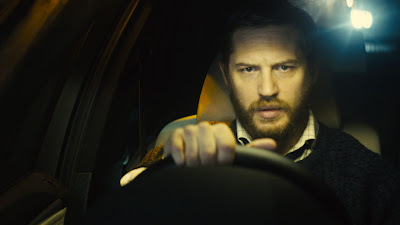 He’s driving toward Bethan (Olivia Colman), the secretary he had a one-nighter with a few months back, resolved to be there for her when she delivers his baby. There will be hell to pay for this decision, yes, but he’s not going to let his mistake get the best of him. He’s not going to let all this work go to waste. He’s going to spend the entirety of his drive making and receiving a series of phone calls that will determine who he becomes when he gets where he’s going. They’ll decide whether or not he still has a job or a family, whether or not the skyscraper he’s building will get started on schedule. The rest of his life is in these next ninety minutes. If he doesn’t manage them exactly right, the entire thing is going to fall apart. Locke is primarily driven by pressure and claustrophobia. Nearly the whole film takes place in and around the driver’s seat of Ivan’s car, and his is the sole face we see. The rest of the cast (Andrew Scott and Ruth Wilson among them) appear only through the dashboard speakerphone as Ivan negotiates his way through the waves of crisis and complication they throw at him. The film is presented in nearly-real time, with only a few cross-fades and blurry visual cues to reorient the audience. 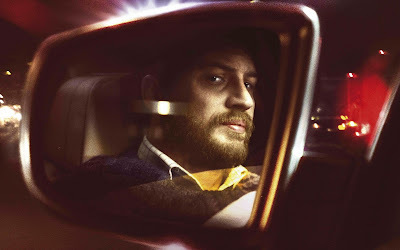 What at first seem like gimmicks are instead the important stylistic choices that writer/director Steven Knight uses to build the larger metaphor of a solitary mind at work. Ivan’s physical isolation means he has to rely on his communication skills, which are at the mercy of his telephone and the people on the other end of it. Dozens of calls are dropped, cut off, and unanswered, creating new issues and forcing him to adapt. The audience must adapt as well, as we are totally locked in Ivan’s point of view. 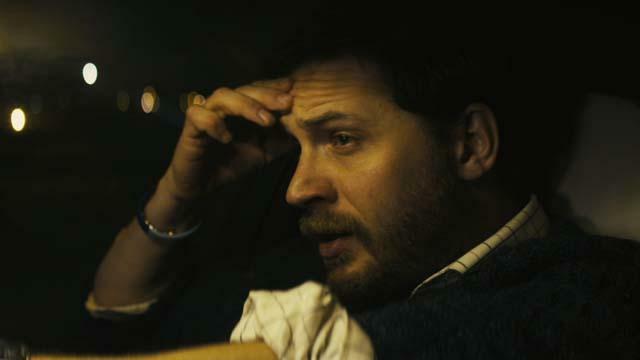 All of this makes Locke an almost unsettling exercise in subjectivity. While that subjectivity certainly colors our opinion of Ivan and of the people in his life, the film wisely resists the urge to make him completely sympathetic. In fact, his heroism gets murkier as the film progresses; we’re never quite sure he’s doing the right thing. He’s willing to throw his entire life away in order to be there for his new child, but he’s also using that child to fight an internal battle against the father who left him years ago. Similarly, while he doesn’t mind the idea of losing his job for abandoning his post, he works tirelessly to ensure that “his” building will still one day steal air from the sky. Legacy, it seems, is what’s important here. Both his child and his building must be born, and he’ll give up anything he has to in order to ensure that. There’s a telling moment in which his wife Katrina complains about the concrete footprints he would frequently leave on their floors, which might hint at an inflated ego or narcissistic tendencies. Again, the visual language of the film corroborates this: we spend the entire running time looking right at him. We’re listening, too. Ivan’s lilting Welsh cadence allows him to project calm control over each new situation. It’s almost musical in its finest moments, the ones in which he’s waxing philosophical about proper concrete mixtures or the simple steps one has to take to Make Everything Okay. While we’d think the limitations of the telephone would hinder him, the physical separation actually allows him to use his most distinctive trait to its full advantage. He can make people deal with him on his terms without ever having to look desperate or emotional. He can talk to his father (represented here as an empty rear car seat) without seeming strange. He never has to look anyone in the eye or stand up to a physical confrontation. His wife cries alone and his kids are left in the dark. We’re the only ones who see him sweating and blowing his nose between phone calls. We’re the only ones who see him screaming bloody murder and staring at his lap in shame. By encasing himself in this protected space in between one place and the other, Ivan is able to stand at a remove from the complicated shitstorm his words and actions have caused. Of course, the clock is running on his break from reality. Everything changes once he gets out of the car and climbs those steps to the hospital. Locke isn’t interested in that, though; that part’s not important. The film is giving us very specific information in a very specific way and then leaving us to our own conclusions. We leave Ivan behind, too. There’s a beautiful moment near the end in which he brings the car to a stop, thinks, and then continues on without us. The camera cranes up and out into the night sky, a fairly basic cinematic convention that would normally cue the audience that the film is over. In this case, it doubles as a way to visually release the tension that’s been building for ninety minutes. The film fades out just as Ivan becomes another anonymous dot of light along the motorway. We’re far away from him now, not able to see or hear anything at all. Maybe that’s the way it should be. Maybe that’s the way he likes it. You wrote something worthy of the film here. Nicely done. Agree with Albert. I really liked Loche and it's a pleasure to read someone appreciating it. This is a fantastic essay on a terrific film. Well-considered and beautifully written. Thanks! I only saw this one recently, and I found it really compelling.